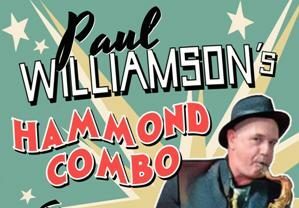 After a 15 year residency at The Rainbow Hotel, Paul Williamson’s Hammond Combo is moving south of the border.The combo features Paul Williamson – Sax, Tim Neal – Hammond Organ and Michael Jordan – Drums. So come on down for some great deep blues on Tuesday night at THE EMBER LOUNGE. The Paul Williamson Hammond Combo is the most swinging and enduring Hammond trio in Melbourne jazz history. Formed more than 20 years ago, they continue to swing and groove like no other band, firmly rooted in the tradition of Jimmy Smith, Lonnie Smith, Jack McDuff and the other Hammond greats. Paul Williamson has toured with everyone from Jo Jo Zep and Dire Straits, to Vince Jones to the great Hammond player Jimmy McGriff. He is one of the most in-demand tenor saxophonists in Australia and a treat to hear play in any context, but none more so than his own trio. also featuring Tim Neal, master of the Hammond B3 organ, and the swinging drummer Mike Jordan. This is the only gig for Paul Williamson’s Hammond Combo, better be quick!